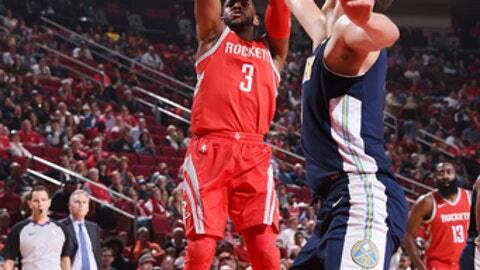 Ariza scored a season-high 25 points, making 7 of 10 from beyond the arc, in the Houston Rockets’ 125-95 victory over the Denver Nuggets on Wednesday night. After missing a month because of a knee injury sustained in the season opener, Paul has re-entered Houston’s rotation seamlessly. Houston led 75-40 at the half, the Rockets’ largest halftime lead of the season. P.J. Tucker started in Anderson’s place, while Luc Mbah a Moute scored 13 points in 26 minutes behind Paul. Houston outscored Denver by 57 points in the 26 minutes that Mbah a Moute was on the floor, the best plus-minus by any player in a game over the last 20 seasons, including playoffs, according to ESPN Stats & Info. After losing two of three on the road trip, the Nuggets will play three of their next four in Denver, where they’re 7-2 this season. Nuggets: Denver scored a season-low 17 points in the first quarter while allowing a season-high 75 first-half points. … Denver’s bench was outscored 41-35, led by nine points each from Juancho Hernangomez, Mason Plumlee and Malik Beasley. As part of Houston’s new ”First Shot” promotion featuring a local celebrity shooting a pregame free throw for charity, Houston Dynamo defender DaMarcus Beasley rattled in his shot, securing a $5,000 donation from the Rockets to charity. The Dynamo are currently facing Seattle Sounders FC in the Western Conference Championship round.